While functional steel and titanium watches are the preference for sailors and divers, the yellow gold watch remains a classic yet bold choice. An unapologetic statement of wealth and style, the gilded timepiece reflects traditional practices of watchmaking and is the ultimate luxury accessory to elevate any outfit. Read on to discover the yellow gold watches sure to dazzle wherever you wear them. From the elegant Classique range, this Breguet watch has a case fashioned from 18 carat gold. The face features a calendar, power reserve indicator, additional time zone indicator and an alarm. 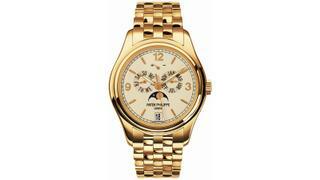 The model is also available with an 18 carat gold bracelet for those who want their timepiece to be truly striking. This 21 carat gold timepiece was originally launched in 1996. Its glittering appearance is complemented by a lacquered cream dial, which features gold hands and hour markers, as well as an annual calendar and moonphase display. The model is also available in rose and white gold, but we think this is the most attractive version. 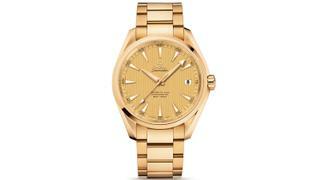 Despite its flashy appearance, this 18 carat gold timepiece is also ideal for on board living. The elegant champagne face, complete with a calendar function, features a teak pattern inspired by yacht decks. Combining style with practicality, this vibrant chronometer Seamaster is also water resistant to 150 metres, so no need to worry about sea water splashes during a crossing. 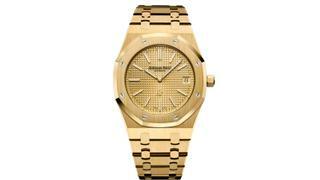 Designed with the signature octagon shape of Audemars Piguet watches, this gold-on-gold creation is certainly a statement piece. 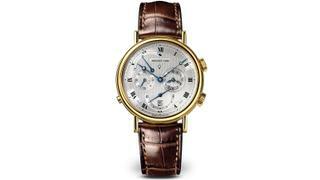 The “Petite Tapisserie” detailing on the gold-tone dial enhances the overall lavish appearance of the 18 carat model. The hands also have a luminescent coating, ensuring that this watch will always shine bright. A Lange & Sohne 1815 "Homage to Walter Lange"
Introduced in 2017, this elegant model is a limited edition, with only 27 pieces in circulation. The traditional watch features complications invented by the Lange family back in 1867 and has a dial crafted from solid silver. The subtle use of gold and understated tan strap mean that this piece can be worn without attracting too much attention – ideal for the more modest of watch-wearers. Rolex pieces are all about bold style and unabashed indulgence. This model is a classic example of Rolex’s reputation for attention-grabbing pieces, with its distinctive green face and bracelet. The case and hour markers are fashioned from 18 carat gold and the face has both date and day of the week displays. A symbol of fine watchmaking, Vacheron Constantin watches boast the exclusive Geneva Hallmark seal. This means that all of their watches are made to the specifications outlined by the Geneva Laboratory of Horology and Microengineering and assembled entirely in the Swiss Canton itself. This minimalist Traditionelle model has a case made from 18 carat, 3N-shade gold with golden hands.